These were also made for the New House Party. I printed the recipe off the Pepperidge Farm Puff Pastry website, which has dozens of awesome uses for a sheet of frozen puff pastry and which I’ll likely visit again for more appetizer ideas. I brought the page with me when I went shopping, to make sure I picked up everything I needed, and then when I finally got down to it Friday night, in the kitchen with everything ready to go, I couldn’t find the stupid paper. So I had to delay my project as I hunted it down online and re-printed it so I had instructions. And then discovered at the very end when I threw the puff pastry box into the recycling bin that the recipe was on the back of it the whole time. Durr. The recipe is here. I followed it exactly except that I had no garlic powder, so I used garlic salt instead. The pastry cracked a little as I rolled it but it held together decently. Cutting it was very hard – maybe it was because my knife wasn’t sharp enough, but I squashed it pretty flat as I cut it so I ended up with flattened ovals instead of pretty round swirls. I also should have greased the cookie sheet, because they stuck a little and I had to chip some of them off. Oh, and I need to acquire a pastry brush. Applying an egg wash with a fork is not very efficient or effective. The result was underwhelming: they were edible (and pretty) but not really anything special. 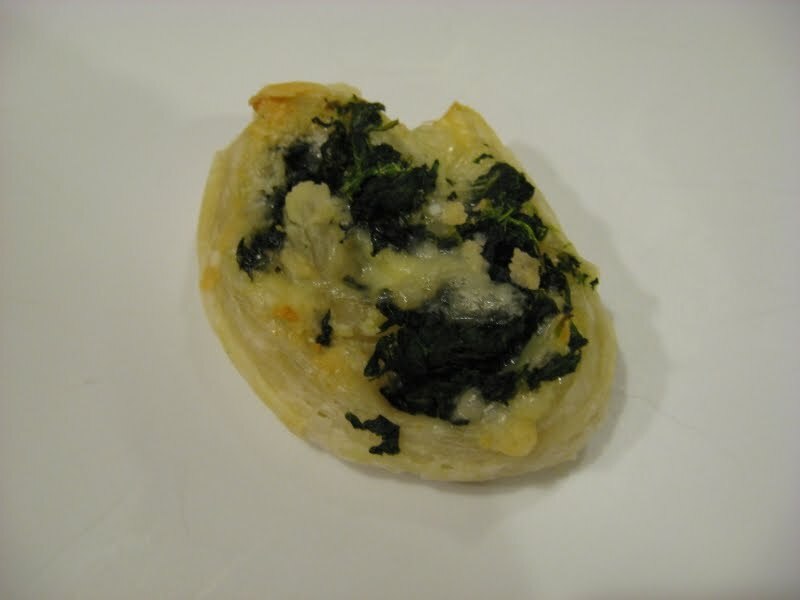 I would have thought that garlic and cheese and spinach always combine and create glorious yumminess, but this flopped. How could it, when it is made from all the flavors I love best? It tasted like a spinach pie, and not a particularly good one. It needed salt, and probably a lot more garlic and parmesan. I might try it again and tweak it for more flavor, but it’s not high on my list of retries. Oh well. Next time use a serrated knife and saw without pushing down much. Too bad the whole was less than the sum of the parts.